A Church of Scotland minister in Orkney once commented that what he admired about the Bahá'í community was that “Bahá'ís knew what they believed”. Regular and systematic study of the meaning and implications of divine guidance are an integral part of Bahá'í community functioning. 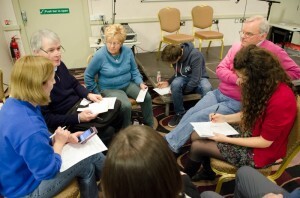 Throughout the world, Bahá'ís hold meetings, generally referred to as study circles, which involve participants working through simple and relevant programmes of study together which focus on such themes as leading a life based on spiritual principles and applying these in our daily lives, for example through service to the local community. While the programmes are based on Bahá'í teachings, they are not intended exclusively for Bahá'ís, and many study circles include friends of the Bahá'ís and/or individuals interested in Bahá'í teachings and principles. Bahá'í study circles in Orkney are held at times and in places which best suit participants – this might be in someone's home, in the Bahá'í Centre in Kirkwall or in some other convenient public venue. If you would like to join a study circle or find out more, feel free to contact us, and keep an eye out in the Activities section of this website, or visit our Facebook page. Learn about the Bahá'í Faith in the UK. Learn about the Bahá'í Faith in Scotland. Find out more about the Bahá'í Faith. Copyright © 2019 Bahá'ís of Orkney. All Rights Reserved.